Russell Darnley’s ‘Seen and Unseen’: Testimony of a man who kept faith with his vision for Australia in the world. I bought Russell Darnley’s Seen and Unseen some months ago and tucked it into a corner of my Kindle, dipping into some of the ‘stories’ in the gaps between my backlog of novels-to-read. With some holiday time on my hands, I decided to start at the beginning – and I couldn’t stop reading. I now saw that the ‘stories’ formed a coherent narrative woven from threads of spirituality, self-discovery, and an expression of one man’s understanding of Australia in the world. The motif of the seen and the unseen, drawn from the Balinese notion of sekala and niskala, signifying the ubiquity of the spiritual world, is the strongest of these threads: How else to interpret the first and last sections of the book, when Darnley converses with his dead grandfather on the cliffs at Coogee? But Seen and Unseen isn’t an extended navel gaze. There’s wonderfully powerful and evocative material about intellectual life in seventies Sydney, about student parties in inner city flats, about the study of Bahasa Indonesia in the brief period when the Australian Government was prepared to fund it generously. In reading Darnley’s book, I realised that he and I had moved in intersecting circles in the seventies and eighties but had (perhaps) never met. 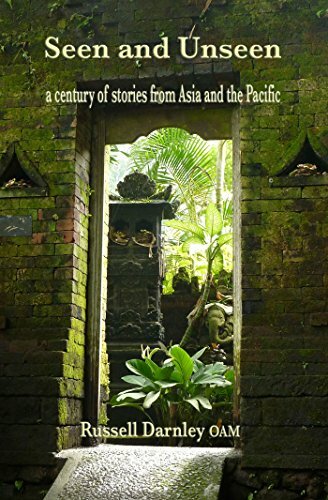 As a university languages school head, I rode the crest of the Indonesian studies movement for a few years, but Darnley’s book brought back uncomfortable memories of my having to close an Indonesian program as funding tightened and the popularity of the language waned in the face of Japanese and Chinese. I was also reminded of the hopes for deep engagement with Indonesia during Gareth Evans’ tenure as Foreign Minister, and the dashing of those aspirations under his successor. For a newish Australian (I arrived in 1977), Darnley’s account of a childhood in Coogee was fascinating; I’ve lived mostly on the north side of the Harbour Bridge, and Coogee is foreign territory for me. Indeed, the biographical thread running through Seen and Unseen is subtly and tenderly handled. While the ‘stories’ follow chronologically, there are gaps, but the reader is given to understand that each story tackles a new stage in the author’s progress through his professional, personal and spiritual life. The middle section of the book is set mostly in south-east Asia, from which I drew two main impressions: One was Darnley’s wonderful work in establishing and running an overseas study centre for Australian students; the other was his extensive knowledge of Indonesia, and especially Bali, based on his years of residence in the region. But the core of the book – in my view at least – is the section dealing with the author’s voluntary work in the immediate aftermath of the 2002 Bali bombings (for which he was awarded the OAM). The description of those days is the most harrowing and powerful writing I have encountered in a long time. I had the strong impression that Russell Darnley’s life up to that moment in 2002 was a preparation for the awful work that he volunteered to do, including searching body bags for identification evidence. Russell Darnley surely was the right man in the right place. Seen and Unseen: The testimony of a man who kept faith with his vision for Australia in the world. Stuart Campbell is a Sydney author. News of his latest novel Cairo Mon Amour can be found here.